Although it might take a second look to see it, the new BMW Sauber has been developed intensively over the winter. Most of the work has gone into the sidepods which now appear to be a step ahead to Ferrari and McLaren. The rear end is so small and low that there was no choice but to lengthen the root of the flipups to be able to attach them to the chassis. The void that was created beneath the flipups is also handily used to add a couple of small winglets. It is however surprising that BMW have opted to hang up a small winglet under the flipup with two struts while they could have easily made use of the support (black) that is connected to the car's floor. A particular novelty relating to the sidepod's shape is the "heck" (tail) wing. 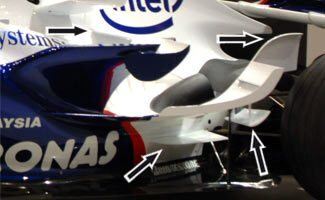 Contrary to the common mid wing placed between the ends of the flipups, it connects the T-wings with the engine cover, creating a wide aerofoil - this item does not create downforce by itself but will rather point air towards the rear wing. Additionally, the T-wing itself is not any longer connected directly to the sidepod but instead glued onto the chimney. Would BMW\'s Engineers be trying for an enhancement of the blown diffuser effect by placing the tail wing onto the chimney? I ask this because it would appear that the wing is actually ideally placed to direct the high pressure exhaust air straight to the most active area of the rear wing. Wouldn\'t directing the exhaust over the wing decrease efficiency? Also in response to why the small winglet (bottom right arrow) is hung like that. Hanging it like that may help by keeping the underside which would produce the negative lift clean to enhance efficiency, also from that picture it looks closer to the top than the floor.